The lecture will focus its attention on the core research area of the museum: discussing, problematising and implementing the notion of ’using’ art and the role of the museum in the 21st century. Art’s perceived role in and value to society is changing. With the demise of ideological binaries between east and west, avant-garde art is no longer positioned as a symbol of a liberal, free society. This means the question of art’s ’use’ or ’use-value’ to society has to be recalibrated – for artists, institutions and the publics we address. This allows us to re-think art not as an autonomous activity, detached from the world, but rather as a tool to be used. 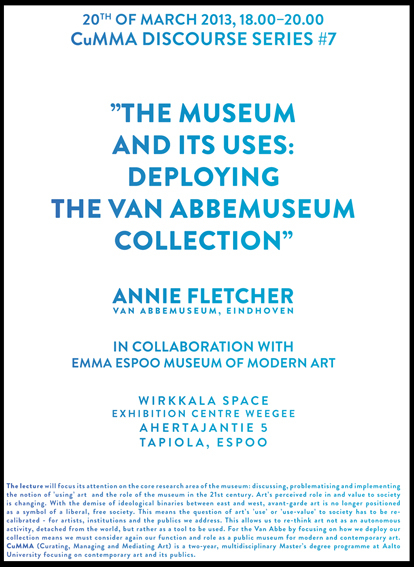 For the Van Abbe by focusing on how we deploy our collection means we must consider again our function and role as a public museum for modern and contemporary art.